A new stem-cell discovery might one day lead to a more streamlined process for obtaining stem cells, which in turn could be used in the development of replacement tissue for failing body parts, according to UC San Francisco scientists who reported the findings in the current edition of Cell. The work builds on a strategy that involves reprogramming adult cells back to an embryonic state in which they again have the potential to become any type of cell. The efficiency of this process may soon increase thanks to the scientists' identification of biochemical pathways that can inhibit the necessary reprogramming of gene activity in adult human cells. Removing these barriers increased the efficiency of stem-cell production, the researchers found. 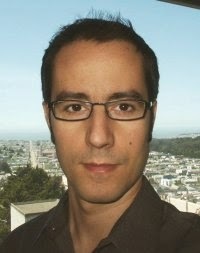 "Our new work has important implications for both regenerative medicine and cancer research," said Miguel Ramalho-Santos, PhD, associate professor of obstetrics, gynecology and reproductive sciences and a member of the Eli and Edythe Broad Center of Regeneration Medicine and Stem Cell Research at UCSF, who led the research, funded in part by a prestigious NIH Director's New Innovator Award. The earlier discovery that it was possible to take specialized adult cells and reverse the developmental clock to strip the mature cells of their distinctive identities and characteristics — and to make them immortal, reprogrammable cells that theoretically can be used to replace any tissue type — led to a share of the Nobel Prize in Physiology or Medicine being awarded to UCSF, Gladstone Institutes and Kyoto University researcher Shinya Yamanaka, MD, in 2012. These induced pluripotent stem (iPS) cells are regarded as an alternative experimental approach to ongoing efforts to develop tissue from stem cells obtained from early-stage human embryos. However despite the promise of iPS cells and the excitement surrounding iPS research, the percentage of adult cells successfully converted to iPS cells is typically low, and the resultant cells often retain traces of their earlier lives as specialized cells. Researchers generate stem cells by forcing the activation within adult cells of pluripotency-inducing genes — starting with the so-called "Yamanaka factors" — a process that turns back the clock on cellular maturation. "From the time of the discovery of iPS cells, it was appreciated that the specialized cells from which they are derived are not a blank slate. They express their own genes that may resist or counter reprogramming." But the nature of what exactly was getting in the way of reprogramming remained poorly understood. "Now, by genetically removing multiple barriers to reprogramming, we have found that the efficiency of generation of iPS cells can be greatly increased," he said. The discovery will contribute to accelerating the safe and efficient use of iPS cells and other reprogrammed cells, according to Ramalho-Santos. 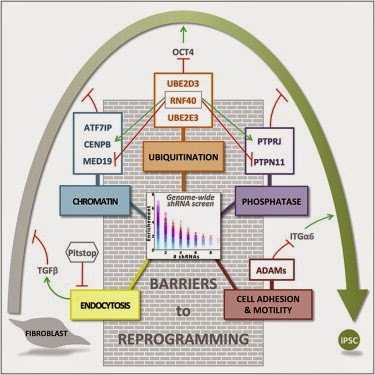 Barriers to human cell reprogramming. Cell, Volume 158, Issue 2, p449–461. The researchers found not merely isolated genes acting as barriers, but rather sets of genes acting in concert through different mechanisms to throw up roadblocks to reprogramming. "At practically every level of a cell's functions there are genes that act in an intricately coordinated fashion to antagonize reprogramming," Ramalho-Santos said. These mechanisms are likely to help adult cells maintain their identities and functional roles. "Much like the Red Queen running constantly to remain in the same place in Lewis Carroll's 'Through the Looking-Glass,' adult cells appear to put a lot of effort into remaining in the same state," he said. To uncover this previously unidentified bustling biochemical matrix of inhibitory gene activity, the scientists had to simultaneously master a few different technical feats in the lab. They combined cutting-edge genetic, cellular and bioinformatics technologies to comprehensively identify genes that act as barriers to the generation of human iPS cells, and probed how these novel barriers work. Apart from maintaining the integrity of our adult tissues, the barrier genes probably serve important roles in other diseases – including in the prevention of certain cancers, according to Ramalho-Santos. presence of 5 small molecule inhibitors. For years, researchers and patients have hoped that embryonic stem cells (ESCs) — capable of forming nearly any cell type in the body — could provide insight into numerous diseases perhaps even be used to treat them. Yet progress has been hampered by the inability to transfer research and tools from mouse ESC studies to their human counterparts, in part because human ESCs are "primed" and slightly less plastic than the mouse cells. Now Thorold Theunissen, Benjamin Powell, and Haoyi Wang, who are scientists in the lab of Whitehead Institute Founding Member Rudolf Jaenisch, have discovered how to manipulate and maintain human ESCs in a "naïve" or base pluripotent state similar to that of mouse ESCs without the use of any reprogramming factors. Their work is described in this week's issue of the journal Cell Stem Cell. Naïve mice ESCs are well-studied, and scientists have a strong understanding of how they function and mature into more specialized cells. But this understanding is of limited use in human ESC research, as the human cells look different, grow differently, and rely on different genes than mouse ESCs. According to Theunissen, the disparities between mouse and human ESCs are attributable not to species-specific differences but rather to differences of cell state. In naïve mouse ESCs, a particular enhancer of the gene OCT4 is active, prompting the researchers to look for the presence of this marker as a means to identify rare naïve human ESCs. With this unbiased reporter system in hand, the Jaenisch team determined that a cocktail of five small molecules with a few additional growth factors can induce and support the conversion of primed human ESCs to a naïve state with or without using reprogramming factors to jumpstart the process. By applying this cocktail to human blastocysts, the scientists could also isolate naïve human stem cells. "This is important because if this cocktail only works in existing lines of human ESCs, you might wonder, does this really capture a distinct state or is this artificial?" says Theunissen. "Since the cocktail works directly on human blastocysts, I think it suggests that we're really capturing a cell state that is already present in the early human embryo." Although other labs have recently reported creating naïve human ESCs, Theunissen, Powell, and Wang question these results as the cells produced through these techniques lack the gene expression and epigenetic profiles of naïve human ESCs. Yet, the Jaenisch lab believes they have now finally unlocked a way to create and maintain this important type of cell and are looking forward to exploring its potential. 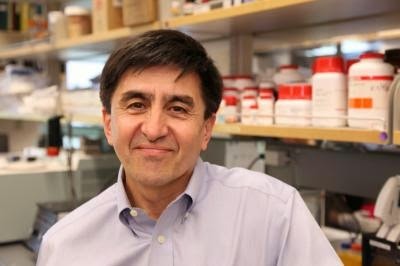 "We have discovered a new pathway to generate something we believe is a totally different state of pluripotency in human ESCs that is very close to the mouse naïve state," says Jaenisch, who is also a professor of biology at MIT. "These cells may be essential for ESC technology, and that is an area we're looking forward to investigating. Now the big question for us is, does this state exist in vivo in embryos? Right now, we don't know, and that is a very interesting line of research." This Saturday, July 19th at 7:30 pm ET/4:30 pm PT, Al Jazeera America’s “TechKnow” shows us one of the most exiting areas of medical research – how umbilical cord blood is being used to treat brain disease and injury. Dr. Joanne Kurtzberg. Credit: Al Jazeera. “Techknow” host and mechanical engineer Dr. Shini Somara takes us inside Duke Children’s Hospital, where a team of doctors is treating young Grace Matthews, an infant with hydrocephalus, or water on the brain, characterized by the tell-tale swelling of the baby’s head. We go behind-the-scenes on the high-tech experimental treatments, as doctors infuse Grace with stem cells from her own umbilical cord, and we meet another young patient who experienced “miraculous” progress from the use of umbilical cord stem cells. The medical equivalent of gold, we’re just at the tip of understanding how stem cells from cord blood, harvested at the time of birth, can be used to help the brain regenerate and heal from injuries and damage. 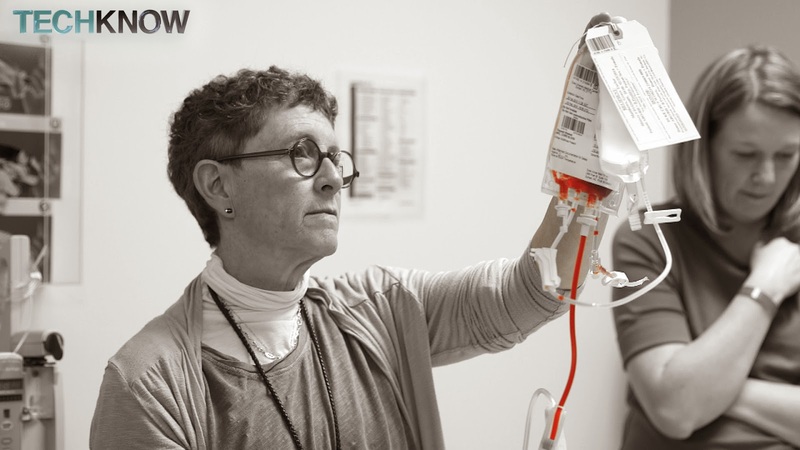 “I personally believe cell therapy, and regenerative medicine, is going to be the next big advance in medicine, and that cells like cord blood are going to drive that forward,” reports Dr. Joanne Kurtzberg, Chief of the Division of Pediatric Blood and Marrow Transplantation at Duke University Medical Center in Durham, North Carolina. Al Jazeera America’s “TechKnow” is a half hour documentary show that airs weekly on Saturdays at 7:30 pm ET/4:30 pm PT. A show about innovations that can change lives, “TechKnow” explores the intersection of hardware and humanity in a unique way – it’s a show about science, by scientists. “TechKnow” rotating cast of hosts includes mechanical engineer Dr. Shini Somara, molecular neuroscientist Dr. Crystal Dilworth, entolomologist Phil Torres, biologist Marita Davison, engineer Kosta Grammatis, science writer Kyle Hill, former CIA operative and analyst Lindsay Moran, neuroscientist Rachelle Oldmixon and neurobiologist Cara Santa Maria. Researchers around the world have turned to stem cells, which have the potential to develop into any cell type in the body, for potential regenerative and disease therapeutics. The researchers discovered that stem cells created by moving genetic material from a skin cell into an empty egg cell — rather than coaxing adult cells back to their embryonic state by artificially turning on a small number of genes — more closely resemble human embryonic stem cells, which are considered the gold standard in the field. "These cells created using eggs' cytoplasm have fewer reprogramming issues, fewer alterations in gene expression levels and are closer to real embryonic stem cells," says co-senior author Joseph R. Ecker, professor and director of Salk's Genomic Analysis Laboratory and co-director of the Center of Excellence for Stem Cell Genomics. The results of the study were published today in Nature. But when they looked closer at the cells, the researchers spotted some differences: the patterns of methylation — chemical flags that are added to genes to control their expression — varied between the cell lines. This indicates a difference in how and when genes, despite having identical sequences, might be expressed. 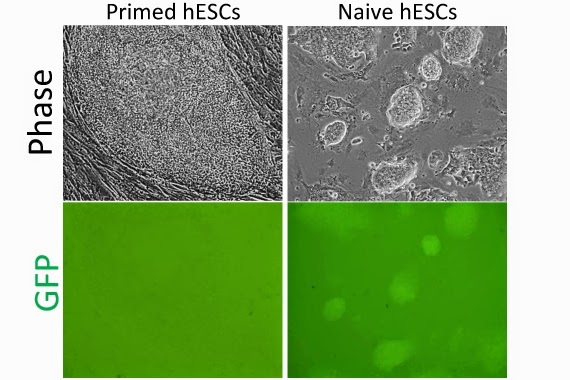 The methylation of nuclear transfer cells more closely resembled hESCs than the iPS cells did. And when the investigators looked at patterns of actual gene expression — by measuring the levels of particular RNA strands produced by each cell — the differences continued. Once again, nuclear transfer cells had RNA levels closer to embryonic cells, making them more accurate for basic research and therapeutic studies. "Both the DNA methylation and gene expression data show that nuclear transfer does a better job at erasing the signature of the original skin cell," says Laurent, who is a co-senior author of the paper. "If you believe that gene expression is important, which we do, then the closer you get to the gene expression patterns of embryonic stem cells, the better," Ecker says. "Right now, nuclear transfer cells look closer to the embryonic stem cells than do the iPS cells." Ecker doesn't expect labs to race to make the switch to nuclear transfer protocols — after all, the method falls within those restricted for federal funding. But he thinks the new observation likely holds lessons that could help improve the protocols for making iPS cells. "What this is telling us is that you can use the standard mix of genes and they do a pretty good job of creating iPS cells," Ecker says. "But they're not perfect. The material in an egg does a better job than just those four genes alone." "At this point, nuclear transfer stem cells combine the key advantages of both hESCs and iPS cells and, as such, are ideal for clinical applications in regenerative therapy," adds Mitalipov. Other researchers on the study were Ryan C. O'Neil, Yupeng He, Matthew D. Schultz, Manoj Heriharan, Joseph R. Nery, and Rosa Castanon of the Salk Institute for Biological Studies; Hong Ma, Brittany Daughtry, Masahito Tachibana, Eunju Kang, Rebecca Tippner-Hedges, Riffat Ahmed, Nuria Marti Gutierrez, Crystal Van Dyken, Alimujiang Fulati, Atsushi Sugawara, Michelle Sparman, Paula Amato and Don P. Wolf of Oregon Health & Science University; Robert Morey, Karen Sabatini and Rathi D. Thiagarajan of the University of California, San Diego; and Sumita Gokhale of the Boston University School of Medicine. that make myelin. Credit: Jing Wang. Scientists at the University at Buffalo have identified the single transcription factor or "master switch" that initiates the critical myelination process in the brain. The research will be published online in Proceedings of the National Academy of Sciences (PNAS) on June 30. The identification of this factor, SOX10, in human brain cells, brings researchers closer to the goal of treating multiple sclerosis (MS) by transplanting into patients the brain cells that make myelin. "Now that we have identified SOX10 as an initiator of myelination, we can work on developing a viral or pharmaceutical approach to inducing it in MS patients," says Fraser Sim, PhD, senior author on the paper and assistant professor in the UB Department of Pharmacology and Toxicology in the School of Medicine and Biomedical Sciences. "If we could create a small molecule drug that would switch on SOX10, that would be therapeutically important," he adds. Stem cell therapy is seen as having dramatic potential for treating MS, but there are key obstacles, especially the length of time it takes for progenitor cells to turn into oligodendrocytes, the brain's myelin-making cells. Using currently available methods, Sim explains, it can take as long as a year to generate a sufficient number of human oligodendrocyte cells to treat a single MS patient. That's partly because there are so many steps: the skin or blood cell must be turned into induced pluripotent stem cells, which can differentiate into any other type of cell and from which neural progenitor cells can be produced. Those progenitor cells then must undergo differentiation to oligodendrocyte progenitors that are capable of ultimately producing the oligodendrocytes. "Ideally, we'd like to get directly to oligodendrocyte progenitors," says Sim. "The new results are a stepping stone to the overall goal of being able to take a patient's skin cells or blood cells and create from them oligodendrocyte progenitors," he says. Using foetal (not embryonic) brain stem cells, the UB researchers searched for transcription factors that are absent in neural progenitor cells and switched on in oligodendrocyte progenitor cells. While neural progenitor cells are capable of producing myelin, they do so very poorly and can cause undesirable outcomes in patients, so the only candidate for transplantation is the oligodendrocyte progenitor. "The ideal cell to transplant is the oligodendrocyte progenitor cell," Sim says. "The question was, could we use one of these transcription factors to turn the neural progenitor cell into an oligodendrocyte progenitor cell?" To find out, they looked at different characteristics, such as mRNA expression, protein and whole gene expression and functional studies. "We narrowed it down to a short list of 10 transcription factors that were made exclusively by oligodendrocyte progenitor cells," says Sim. 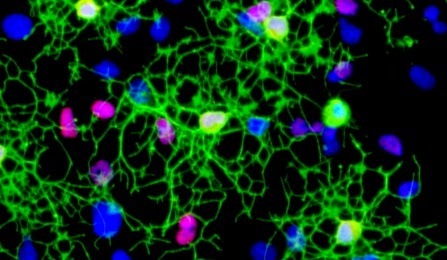 "Among all 10 factors that we studied, only SOX10 was able to make the switch from neural progenitor to oligodendrocyte progenitor cell," says Sim. In addition, the UB researchers found that SOX10 could expedite the transformation from oligodendrocyte progenitor cell to differentiation as an oligodendrocyte, the myelin-producing cell and the ultimate treatment goal for MS.
"SOX10 facilitates both steps," says Sim. That's tantalizing, he says, because one of the biggest problems with MS is that cells get stuck in the step between the oligodendrocyte progenitor cell and the oligodendrocyte. "In MS, first the immune system attacks the brain, but the brain is unable to repair itself effectively," explains Sim. "If we could boost the regeneration step by facilitating formation of oligodendrocytes from progenitor cells, then we might be able to keep patients in the relapsing remitting stage of MS, a far less burdensome stage of disease than the later, progressive stage." 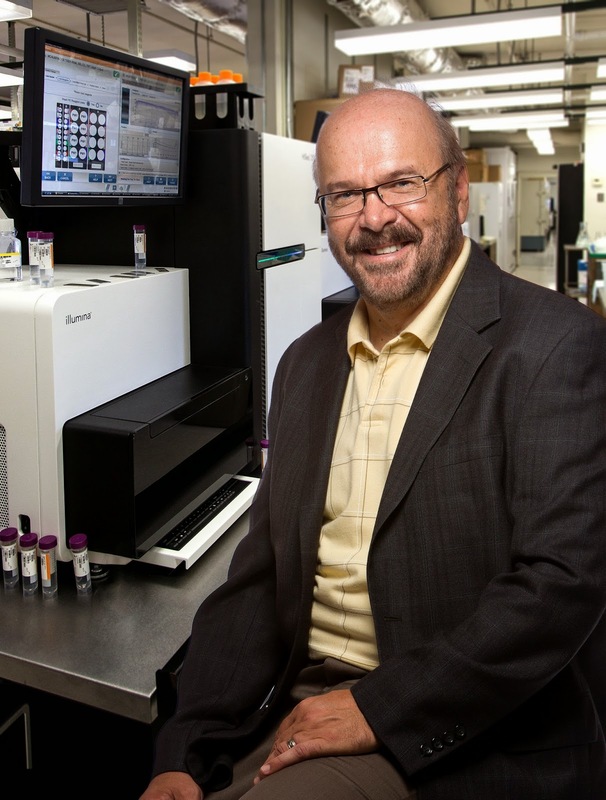 Sim is also an investigator with other scientists at UB and the University of Rochester on the $12.1 million New York State Stem Cell Science award led by SUNY Upstate Medical Center. The research will test the safety and effectiveness of implanting stem cells that can reproduce myelin into the central nervous system of MS patients. About seven days after conception, something remarkable occurs in the clump of cells that will eventually become a new human being. They start to specialize. They take on characteristics that begin to hint at their ultimate fate as part of the skin, brain, muscle or any of the roughly 200 cell types that exist in people, and they start to form distinct layers. Although scientists have studied this process in animals, and have tried to coax human embryonic stem cells into taking shape by flooding them with chemical signals, until now the process has not been successfully replicated in the lab. But researchers led by Ali Brivanlou, Robert and Harriet Heilbrunn Professor and head of the Laboratory of Stem Cell Biology and Molecular Embryology at The Rockefeller University, have done it, and it turns out that the missing ingredient is geometrical, not chemical. "Understanding what happens in this moment, when individual members of this mass of embryonic stem cells begin to specialize for the very first time and organize themselves into layers, will be a key to harnessing the promise of regenerative medicine," Brivanlou says. "It brings us closer to the possibility of replacement organs grown in petri dishes and wounds that can be swiftly healed." In the uterus, human embryonic stem cells receive chemical cues from the surrounding tissue that signal them to begin forming layers — a process called gastrulation. Cells in the centre begin to form ectoderm, the brain and skin of the embryo, while those migrating to the outside become mesoderm and endoderm, destined to become muscle and blood and many of the major organs, respectively. Brivanlou and his colleagues, including postdocs Aryeh Warmflash and Benoit Sorre as well as Eric Siggia, Viola Ward Brinning and Elbert Calhoun Brinning Professor and head of the Laboratory of Theoretical Condensed Matter Physics, confined human embryonic stem cells originally derived at Rockefeller to tiny circular patterns on glass plates that had been chemically treated to form "micropatterns" that prevent the colonies from expanding outside a specific radius. When the researchers introduced chemical signals spurring the cells to begin gastrulation, they found the colonies that were geometrically confined in this way proceeded to form endoderm, mesoderm and ectoderm and began to organize themselves just as they would have under natural conditions. Cells that were not confined did not. 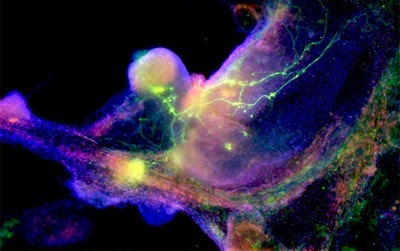 By monitoring specific molecular pathways the human cells use to communicate with one another to form patterns during gastrulation — something that was not previously possible because of the lack of a suitable laboratory model — the researchers also learned how specific inhibitory signals generated in response to the initial chemical cues function to prevent the cells within a colony from all following the same developmental path. 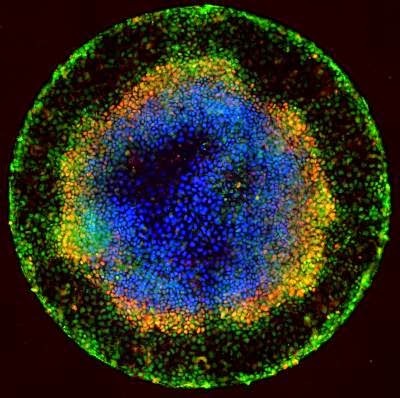 "At the fundamental level, what we have developed is a new model to explore how human embryonic stem cells first differentiate into separate populations with a very reproducible spatial order just as in an embryo," says Warmflash. "We can now follow individual cells in real time in order to find out what makes them specialize, and we can begin to ask questions about the underlying genetics of this process." The research also has direct implications for biologists working to create "pure" populations of specific cells, or engineered tissues consisting of multiple cell types, for use in medical treatments. "These cells have a powerful intrinsic tendency to form patterns as they develop," Warmflash says. "Varying the geometry of the colonies may turn out to be an important tool that can be used to guide stem cells to form specific cell types or tissues."